After I left school I studied law and specialised in copyright law. I worked for an indy label in Paris, until I moved to Sony in New York. It felt super corporate, which was not my thing and as I was dating a bartender at the time I became more interested in the cocktail world… so much so, I actually began working part-time in a cocktail bar called The Weyland. 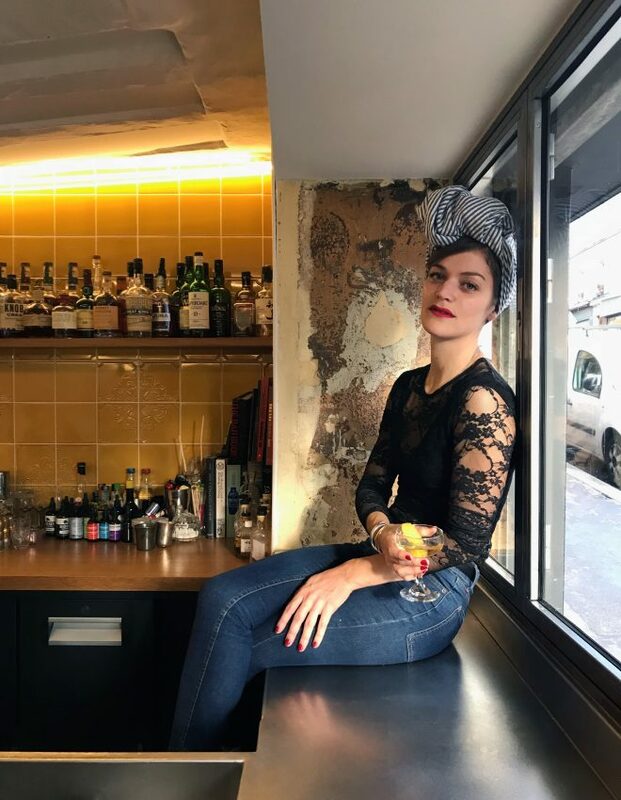 When I moved back to Paris I met with Gladys from Experimental Cocktail Club and asked if they were looking for anyone. After a few weeks working there I realised I didn’t want to go back into the music industry, so focussed all my attention on bartending. I stayed at ECC for three years until an opportunity arose to open my own bar, Combat with my business partner. The bar is called combat for two reasons: the first is our bar is located in Belleville, which was originally split into two neighbourhoods, this one actually being named Combat and the second reason was it felt like we had actually gone through combat to open. Being two women trying to open a bar here felt like a constant fight with everyone, from the banks to contractors, it was extremely difficult. That’s why we love the name of our bar, it just feels right. My dream bar would have a restaurant as well, as I love food. So if money was no object or you guys could wave a magic wand we’d get the place next door too, open it up, so it was a huge space. Along with our cocktails we’d serve great fusion food, inspired by places I love like Maison Premiere in New York or Le Mary Celeste in Paris. I ride my bike. I ride my bike all the time, I never use any other form of transportation as cycling relaxes me.I also eat a lot. I probably eat out in restaurants at least three times a week. I especially love places that serve natural wine and sharing plates. Calvados because I think it’s so fruity. It’s sweet, it’s strong and it’s refreshing. It works so well with everything from other fruits to vinegar and vegetables. My favourite is Christian Drouin and for our opening they gave us a bespoke bottle filled with their award-winning 1989 calvados. Balance and I love a drink that surprises me. When a drink looks a certain way or has certain ingredients where you think you know what to expect, then it surprises you. I love that. Vinegar, as I love the bitterness, the sweetness and the tartness. I know it sounds weird, but I love anything fermented and smelly. At the moment I am using an apple vinegar a lot and another made with Douglas Pine. Easy. Go and see Jesse at Jiggers in Ghent, Belgium.